Forty-one years ago today — October 11, 1971 — Imagine was released in the U.S. It has since become one of the most critically acclaimed and beloved songs the world over. How often can we say that we hear something very different, something that is new, fresh, different, unique, and that has nothing to do with the advancement of technology or science? But for some of you I suspect, the song is, well, a bit problematic. Because, through a simple set of words, put together with a simple set of notes, and sang by a simple single voice, it expresses a worldview that challenges like no other. I wonder if you can enjoy the song as art, putting aside the ideology it espouses. 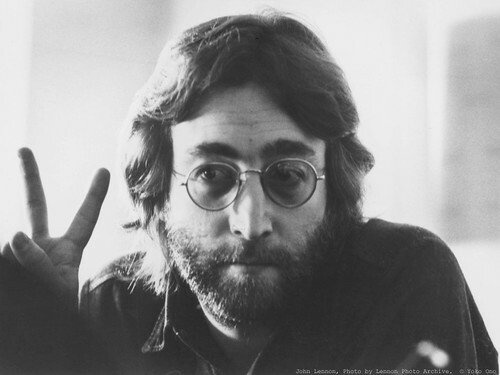 According to Yoko Ono, who controls the rights to John Lennon’s music, the most frequent request she gets comes from musicians who want to record this song but change the “No religion, too” line – a request she reportedly has always denied. Cee Lo immediately responded to the backlash (justifiable, IMHO) by claiming peaceful intent. Well… okay. I can’t help but suspect that Cee Lo took the easy, politically correct route. Imagine that. I think it is very, very, very, very hard to even imagine a break away from convention. To believe the unbelievable. To imagine the unimaginable. And when great minds do, it is very, very, very, very hard to get others to follow. There’s one sentiment in the song that I think Lennon got exactly right. Mike, isn’t asking people to let go of their beliefs rather unthinkable? Interesting how you interpret with a more individualistic slant; I don’t draw that from the lyric, but perhaps that’s what makes great lyrics great; we can take away different messages! Remember singing Beatle tunes on stage with you. I don’t think we did “Imagine”, but probably should have. I don’t have any stripper stories as good as Mike’s…well at least not that relate to John Lennon or the Beatles…!! !…but I think some perspective may be in order in the “science vs. religion” topic. If one looks at the span of history, there is no “religious war vs. science” as people may be lead to think. For example, Nicolaus Copernicus dedicated his most famous work, ‘On the Revolution of the Celestial Orbs’, to Pope Paul III, so certainly he was not an enemy of religion. As for Galileo, when he met with the pope, Urban VIII, in 1623 to present his case, they were old friends. Galileo presented his findings as the absolute truth, not as a scientific theory, which caused friction. And, as it turned out, his theory was wrong; he presented the sun as the center of the universe, not the solar system. The vast majority of time in the western world, religion and science have worked together for the good of humanity. Harvard, Princeton, and Yale, as well as 229 of the first 247 colleges is the USA, were founded by religious institutions. So was Oxford. Medical science? Google the list of hospitals in Illinois, about half were founded by religious institutions. Astronauts? Many of them believed in a God. A little known fun fact is that the first liquid and solid food consumed on the moon were communion elements. There have certainly been countless atheist scientists; and none of what I just wrote proves anything towards the existence of a God. And I acknowledge that there are some small but vocal religious groups today that believe that the world is only 6000 years old (instead of 4 billion, which it actually is) who make me grimace. My point is that there does not seem to have been a concerted, sustained anti-scientific effort through the centuries on the part of the religious community. If anything, statistically, the opposite is true. Thanks again for another thought-provoking article! Your blog is amazing. Yowsa, Pete … Not sure what you saw in the lyric or the post that moved you to a science vs. religion rant … But, as usual, your historical citations are impressive! Have you ever thought about teaching? Hi John, sorry, I didn’t mean it as a rant. I reread my post again and I didn’t make my final point, which is: “Imagine there’s no religion” is indeed impossible, but not just for the “religious people”. Belief in a deity is so ingrained in the history and formation of our western society over the past 2000 years, in our political, educational, medical, and legal systems that is most likely impossible to accurately imagine what the world would look like without it. As for a society that eliminates and outlaws belief in a god, we’ve seen what that looks like with the atheist USSR, a country that killed 50,000,000 (give or take!) of their own people from 1917-1989. My in-laws are some of the lucky ones that were rescued. I’m guessing Mr. Lennon may have had a different take on life if he would have grown up in Leningrad vs. Liverpool in the 1950s. Now that is something to imagine!!! And YES, I think it’s silly for people to request to change the words to the song. Are they that insecure in their belief, I wonder? And how about “no possessions”? We should meditate on that more often. We’re not on the same page here Pete. Imagine there’s no religion is hard … it certainly does go against the grain … but it is not impossible! For you to assume to know what is impossible for me to imagine is pretty interesting in and of itself, don’t you think? Nowhere and no how am I advocating eliminating and/or outlawing belief in a god … and while your hypothetical regarding where Mr. Lennon lived does not really hold for me, it doesn’t make any sense to me to elaborate on that point. Happy Holidays — no; Merry Christmas (and Happy New Year) to you and yours!